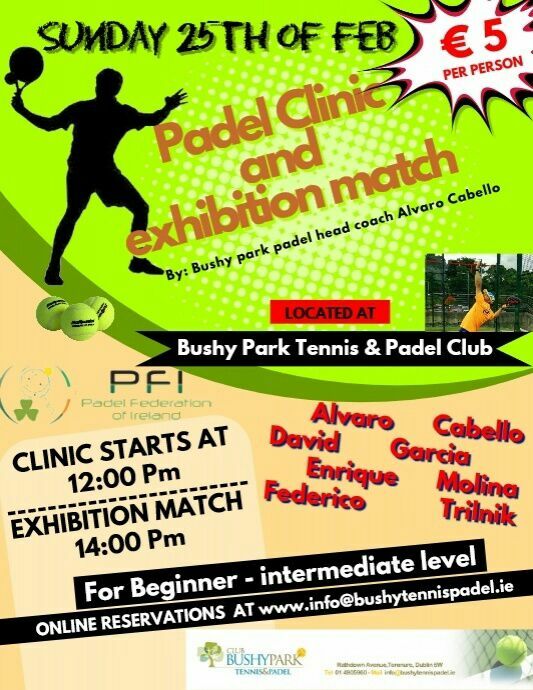 Come along to the Padel Clinic and Exhibition Match with the top players in Ireland by the hand of the Padel Federation of Ireland. The event will take place in Bushy Park Tennis & Padel Club. Alvaro Cabello, David García, Enrique Molina and Federico Trilnik will be available to introduce you to padel or to develop your current standard and skills. They will also delight those attending with their impressive padel play at the exhibition match. The event will take place on Sunday 25th February. The Clinic will begin at 12 noon and the Exhibition Match will commence around 2 pm.